Many know him as Jim Halpert from “The Office,” and some saw him earlier this year in Michael Bay’s “13 Hours: The Secret Soldiers of Benghazi.” And while he will always be remembered for the former, John Krasinski is further dipping his feet into the pool of directing. About a man who has to go back to his small hometown and his old life when he learns of his mother’s illness and subsequent surgery, “The Hollars” premiered at Sundance earlier this year and it’s certainly one of the more feel-good dramedies of 2016. Krasinski, pulling double duty by directing and starring, speaks reverently about the cast, which includes Margo Martindale, Richard Jenkins, Sharlto Copley, Anna Kendrick, and Charlie Day. He reflects on the “existential” pull of family, his deep desire to stay true to a character and the story being told, and what he’s learned from past directing experiences. Written by James C. Strouse, “The Hollars” is now in theaters. You’ve directed before in the past. What have you learned from your previous directing gigs that you brought to this film? Great question! I think that there was certainly a certain confidence to directing this time. I don’t think you ever feel fully confident or fully formed as a director. I know what I am as a director, which is I’m still learning how to do it and i think that my favorite directors would say that no one’s ever done learning how to direct. It’s always a process. And so for me, there was a confidence in not being so nervous of “oh my God, what is today going to bring?” There was more a confidence of accepting what today was going to bring. And certainly we had our fair share of obstacles and things that were thrown in the mix. I think I was much more prepared for the idea of not being prepared, if that makes any sense. Like some weird riddle [laughs]. I remember thinking I was so lucky in my first movie to get an incredible cast of actors… I think Martin Scorsese said that 90% of your work as a director is casting. So I really wanted to work hard at getting the right cast together and I was so thrilled to get these people to be in the movie. At the end of the day, there are so many different stories to tell that for me, choosing this one was a thing that I learned, which was: Choose something that you feel people can relate to and connect to. Especially in this film. Not that I always have to have things that people can relate to, but this one, I just thought, “In today’s world, it’s nice to always remember the importance of family.” I think some of those simple ideas are the stories that need to be told more nowadays. Because certainly we have many stories that are very complicated in both film and television. Sometimes, it’s nice to just get back to that classic idea of family. The film deals with a lot of real issues, like cancer and family situations, but at the same time, it’s very upbeat. I was a little frustrated about the ending though [laughs]. I know! I know, it’s pretty intense. But in general, these themes, we’ve seen them over and over again. They’re not new, but people are always drawn to them. Is that what initially drew you to this film? Yeah! I think there’s something universal about family, that whether you like your family, don’t like your family, whether your family’s complicated or not… we’re all from a family. It’s where we’re from. I said when we [he and wife Emily Blunt]decided to move back to the east coast, it’s cause there’s an existential magnet to family. It’s always going to pull you there and pull you closer. And I think that that’s really interesting. And this is a such a dysfunctional family that when I got to the end of the script I said, “Oh my God, that’s my family!” I come from a very tight-knit, loving family, and yet there were things that I could relate to. Certainly not specifically in the characters because they’re very different than my family, but those ideas of going home and seeing your family again. The idea of having your own individual world unto yourself and then to have to go and reintroduce yourself to the world of your family and play by those rules and sort of enter a whole new arena that you thought you’d left behind. It’s all really fascinating stuff. Powerful stuff. I can’t wait to see people’s responses to the movie because I hope they’re all different. You don’t have to have a mother with a brain tumor to relate to the power of your feelings for your mom. I hope everyone relates to this in their own individual way. Yeah, she’s unbelievable! And in this movie in particular… I mean, look, she’s one of the best actresses around. And for her to get acknowledgment on this in any way, shape, or form is huge and that would be the most important thing for me, that she gets the accolades that she deserves for such a powerful role. Yeah, she and the entire cast are fantastic. What was the casting process like for this film? Funnily enough, the first job I ever did, I was in college and I was an extra in a Marshall’s commercial. 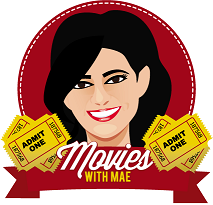 And they upgraded me to “featured extra” [laughs], and Margo was the other main character in the commercial. It was the first gig I ever did and I met her. So I’ve always followed her career and I bumped into her here and there and then I finally just called her and said, “Would you ever be in this movie?” and she said, “Yes, absolutely!” Getting her was something really special personally for me. And, this is not a joke, Richard Jenkins said, “Love the script. If you get Margo Martindale, I’ll do it.” So as soon as I got Margo, he was in and then Anna [Kendrick] is one of those people that this role, if played by anybody else would just feel like the girlfriend role. And I knew that I needed it to be so much more than that. Your relationship with the people you’re in love with are always deep and the palette is very vast, so you need someone who can bring that well of acting ability to make the specifics really tight and strong and I knew she would. And she did. And Charlie Day, I’ve known Charlie for a little bit, just bumped into him here and there and have always been a huge fan, so I’m really lucky that he said yes. Sharlto [Copley], by the way, I remember watching “District 9” and saying that’s one of the best performances I’ve ever seen. And then you see him in this… I think a huge compliment is when people see this movie, no one believes he’s the guy from “District 9.” That just shows you how talented he is. You produced “Manchester by the Sea,” which also premiered at Sundance. I did, yeah! “Manchester by the Sea” was actually more of a creative/producing thing for me. It was my idea. So I had an original idea, that was going to be the first script I ever wrote. I brought it to Matt Damon, who introduced me to Kenny Lonergan, who ended up directing it and writing it. So it was basically my first original idea, I had the whole thing laid out and brought it to Kenny and he had such a great, specific take on it. And they went forward and were nice enough to make me an executive producer. So I sort of stepped back and watched them do their thing. That was a very Kenny-specific story and it’s a very intense story. So well done that when you have an artist like Kenny doing something he really believes in, you just step out of his way and let it happen. Randall Park played the doctor in this movie. And he played Asian Jim on “The Office.” Did you guys laugh about that on set? I don’t even think we talked about that on set! That’s certainly the reason why I cast him though. 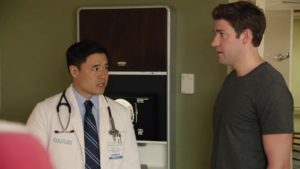 I knew him from there, but I also knew him from “The Five-Year Engagement.” He was in [the movie]with my wife and I went back and visited [“The Five-Year Engagement”] set a couple of times and two of the days I was there, they were doing Randall Park scenes. And I was heaving laughing. It was almost violent. I just remember thinking he was so unbelievably funny and talented and then when you meet him, he’s so soft-spoken and sweet and kind. So I just thought he’d be perfect for this role. Again, I didn’t want it to just be the doctor role. There’s some off-beat humor in there and I wanted someone who was really funny to pull it off and he was so game for it. I’m lucky to have had him in it, but [laughs]I love that everybody’s like, “Oh my God, it’s Asian Jim!” If that’s the big revelation that both of us are onscreen at the same time… [laughs]. In terms of acting and directing, what do you think you bring as a director vs. as an actor? I think there’s something about approaching both in the same manner. To me, what I try to do as an actor is connect to the truth of what is happening in the situation. And “The Office” is a really good example. I think the reason that show was so successful was not just because it was a comedy that people could tune into every week. I think it was because when the show ended, you were like, “There’s a Dwight in my office, or I’m in love with someone in my office, or my boss is insane.” There’s a universality to it and so I think the same applies for acting, which is you try to connect to those real feelings. You don’t necessarily come up with something manufactured. You try to connect with the truth of what this character is going through. Did you work at all with writer James C. Strouse? I didn’t work with him on the script. We had very little rewriting to do. I think Jim is one of the most talented writers out there because he’s able to navigate these hairpin turns between comedy and drama in a way that isn’t manipulated. Stories about families are usually like, “There’s the crazy mom and there’s the weird aunt” and everything is sort of a caricature of the characters rather than real people. The ability to tell emotional and [then go]right into comedy, that’s how life is. Bad things happen without you planning for it and good things happen without you getting to plan for it. It just happens everyday you wake up, it’s just going to happen to you and I think there’s something really profound about the way he writes that with that specificity. So for me, that’s what that was. Any projects you’re working on right now? Just got announced, I’m doing “Jack Ryan” for Amazon! Amazon’s doing a series on Jack Ryan and I’m lucky enough to be able to play that role. So again, it’s this new thing for me. People have asked me before, “What direction do you want to head in next?” And the best part about nowadays is that it’s the wild west. You can do anything you want and try all these different avenues. And for me, after “The Office,” the only thing that was important is that I worked on stuff that was interesting for me and different for me. So “13 Hours” was obviously incredibly different than Jim from “The Office.” But that’s what made it thrilling and that’s what made it scary. That’s what made it such a worthwhile thing. “Jack Ryan” is very different, too. So to helm a show like that… I’m terrified and nervous, but also really excited. Oh my God, I love that character. I love the books and the movies. He’s kind of like our James Bond, so I’m really looking forward to it.